How Do You Say Peaked Cap in Hungarian? Shako of the 73rd Regiment acquired by the Black Watch Museum in 2000 with an NFA grant of £1,250. To celebrate the 60th anniversary of the National Fund for Acquisitions, many of this year’s Object of the Month posts on the Black Watch Museum’s website will feature acquisitions made with the support of the Fund. 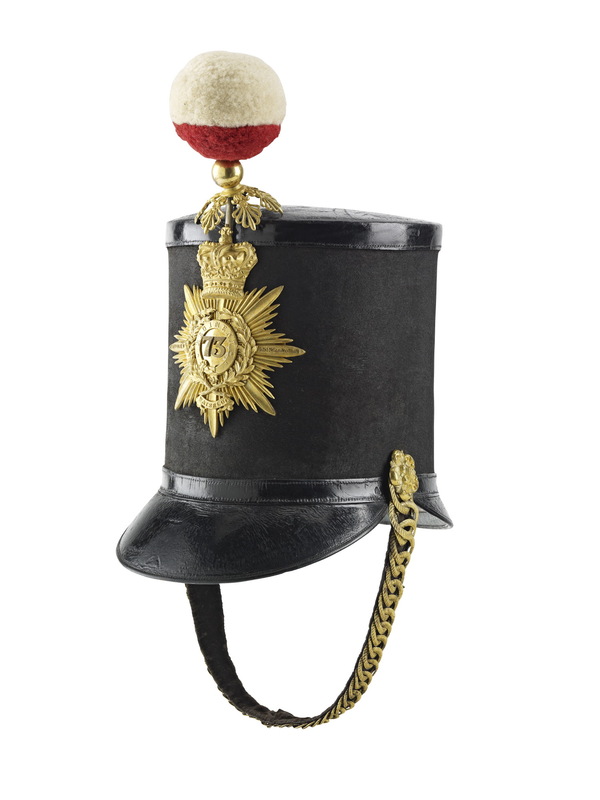 June’s Object of the Month was a shako of the 73rd Regiment of the pattern worn between 1844 and 1855. It is currently on display in the Black Watch Museum’s Day in the Life gallery, in a case that looks at the theme of dress. The word shako comes from the Hungarian name for ‘peaked cap’. Shakos were adopted as part of military uniform across Europe from about 1800.The shako is made of heavy felt and leather. This particular example features a gold badge of the 73rd on the front with the battle honours Seringapatam, Waterloo and Mangalore. The shako has a gold-embroidered chin strap secured by gold rosettes. The 73rd started out as the second battalion of the 42nd, raised in 1779. Seven years later, the 2nd Battalion became a regiment in its own right, the 73rd Highland Regiment. The 73rd saw service around the world, including India, Australia, Waterloo and South Africa, before rejoining the 42nd and once again becoming the 2nd Battalion The Black Watch (Royal Highlanders). 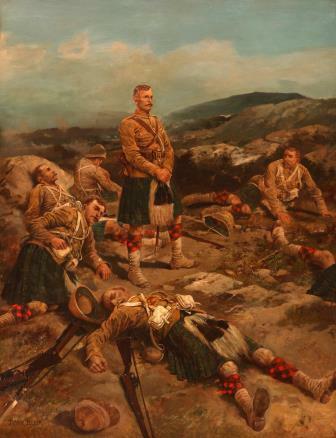 Oil painting, ‘No Surrender: The Black Watch at Magersfontein’, 1900, by Frank Feller, acquired by The Black Watch Museum in 2000 with an NFA grant of £5,000. To celebrate the 60th anniversary of the National Fund for Acquisitions, many of this year’s ‘Object of the Month’ posts on the Black Watch Museum’s website will feature acquisitions made with the support of the Fund. May’s Object of the Month was No Surrender, The Battle of Magersfontein, The Black Watch – 11 December 1899, an oil painting by Frank Feller. The Battle of Magersfontein took place on 11 December 1899, during the Boer War. It was the second of three major defeats suffered by the British Army within one week. The Black Watch were in the front during the dawn attack at Magersfontein and suffered heavy casualties, with 93 men killed and 209 wounded. The dead included one of the Regiment’s most illustrious officers, Major General Andrew Wauchope, who was in command of the whole Highland Brigade. Combined with the casualties in the other Highland Regiments the impact of these losses in Scotland was devastating. These defeats, known collectively as ‘Black Week’ in Britain, shocked the public. Popular feeling at the time was strongly sympathetic to the fighting soldier. No Surrender reflects the public mood and celebrates the heroism of the common soldier. Frank Feller (1848-1908) was a Swiss artist who settled in England. He is known for his regimental costume studies published as illustrations to Her Majesty’s Army in 1890/1.